Sticky word that, almost evokes a sense of alarm. Here comes the Tariff, run. Its an old word, used I would say since Cain charged Abel a fee for the salads. But, its not really a word to strike fear and dread (as some would have) amongst the “common folk”, fear and dread of what. Face it, high finance has been controlling the import/export exchange for centuries and the people have done nothing to change that, or could if they tried. The way inter-state foreign businesses are ran, is a wheeler-dealer world of intrigue and “James Bondian” secrecy. To wit some in the government seem hell bent on placating the world at the expense of the American working people. Why? Good question, one I am unable to answer, or even attempt to understand. And her base Elfin brood there for thee left; such, men do changelings call, so chang’d by Faeries theft. “Faery Queen”, Bk. I, c. 10. The same superstition is thus alluded to by Shakespeare: A lovely boy, stol’n from an Indian king, She never had so sweet a changeling. “A Midsummer Night’s Dream”, Act II., Sc. 1. And again, in another of his plays, the Fairy practice of exchanging children is mentioned: O, that it could be prov’d, That some night-tripping Fairy had exchanged In cradle-clothes our children, where they lay, And call’d mine, Percy, his Plantagenet: Then would I have his Harry, and he mine. “Henry IV”., Pt. 1., Act I, Sc. 1. In Scotland and other countries the Fairies were credited with stealing unbaptized infants, and leaving in their stead poor, sickly, noisy, thin, babies. But to return to Wales, a poet in “Y Brython”, vol. iii, p. 103, thus sings: Llawer plentyn teg aeth ganddynt, Pan y cym’rynt helynt hir; Oddi ar anwyl dda rieni, I drigfanau difri dir. European custom of kindling bonfires on certain days of the year, dancing round them and leaping over them. Effigies are sometimes burnt in the fires. All over Europe the peasants have been accustomed from time immemorial to kindle bonfires on certain days of the year, and to dance round or leap over them. Customs of this kind can be traced back on historical evidence to the Middle Ages, and their analogy to similar customs observed in antiquity goes with strong internal evidence to prove that their origin must be sought in a period long prior to the spread of Christianity. Indeed the earliest proof of their observance in Northern Europe is furnished by the attempts made by Christian synods in the eighth century to put them down as heathenish rites. Not uncommonly effigies are burned in these fires, or a pretence is made of burning a living person in them; and there are grounds for believing that anciently human beings were actually burned on these occasions. A general survey of the customs in question will bring out the traces of human sacrifice, and will serve at the same time to throw light on their meaning. A deity whose life might in a sense be said to be neither in heaven nor on earth but between the two, was the Norse Balder, the good and beautiful god, the son of the great god Odin, and himself the wisest, mildest, best beloved of all the immortals. The story of his death, as it is told in the younger or prose “Edda”, runs thus. Once on a time Balder dreamed heavy dreams which seemed to forebode his death. The next Fairy tale that I shall give akin to the preceding stories is to be found in “Y Brython”, vol. iii., pp. 459-60. The writer of the tale was the Rev. Benjamin Williams, whose bardic name was Gwynionydd. I do not know the source whence Mr. Williams derived the story, but most likely he obtained it from some aged person who firmly believed that the tale was a true record of what actually occurred. In the “Brython” the tale is called: “Y Tylwyth Teg a Mab Llech y Derwydd,” and this title I will retain, merely translating it. The introduction, however, I will not give, as it does not directly bear on the subject now under consideration. The following tale I received from the mouth of Mr. Richard Jones, Ty’n-y-wern, Bryneglwys, near Corwen. Mr. Jones has stored up in his memory many tales of olden times, and he even thinks that he has himself seen a Fairy. Standing by his farm, he pointed out to me on the opposite side of the valley a Fairy ring still green, where once, he said, the Fairies held their nightly revels. The scene of the tale which Mr. Jones related is wild, and a few years ago it was much more so than at present. At the time that the event is said to have taken place the mountain was unenclosed, and there was not much travelling in those days, and consequently the Fairies could, undisturbed, enjoy their dances. But to proceed with the tale. A Four in this suit is the teamwork card, often symbolized by two couples who have come together to create something profitable and enduring. Quite likely, they will create a gift for the future — a business, hospital, theater or university. They represent the founding families of the future community that will grow around their inspiration. Teamwork is the key. It takes time to build a grand vision; and other people of ambition and talent must be attracted to it for it to fulfill its potential. What we see here is the start-up group, the founding visionaries committing their energies to designing the blueprints and laying the groundwork. This partnership is the prototype for society or any grouping where the whole is greater than the sum of the parts. This Week’s Tarot Card Is the World Reversed! This month’s cards encourage us to explore personal balance further, making sure our actions match the values we have claimed for living life. Self-examination is a constant necessity if we are to keep one side of the scale from tipping too far, throwing us off balance and off course. The cards pulled this month talk a lot about patterns and points of view. They suggest that an attitude of acceptance and patience encourages growth and keeps us discovering more of what life has to offer. This card shows the four element symbols of Fire, Earth, Air, and Water in balance, creating space in the center for the fifth element, Aether. We saw this quincunx arrangement in our theme card, Justice, as well. It suggests the importance of giving equal attention to all vital parts of life. Additionally, to the alchemists it served as a symbol of the whole consisting of more than the sum of its parts, which is an apt illustration of the kind of achievement experienced in the World card. The brackets enclosing the quincunx show this set of knowledge fused as one, denoting the end of one cycle through the ongoing quest for self-knowledge. When the World appears reversed in a reading, as it is in our spread, it can signify stagnation and a lack of completion. It suggests that balance is not being achieved, which might simply be a natural progression from our work with the Seven of Cups last week. Prioritizing items in a list (last week’s exercise) means that focus may be given temporarily to one thing at the expense of others. This is natural and will sort itself out with time, but we may want to take a more active approach to encouraging that alignment. This month’s theme of Justice is very cerebral, and it might be helpful to take occasional breaks from all the time spent in our heads. If you are feeling stagnated or overly focused on one aspect of existence, take a few minutes to examine where attention is being placed. Spend some time in any underrepresented realms. Is anything lacking? If so, how can you reconnect with that aspect of yourself? 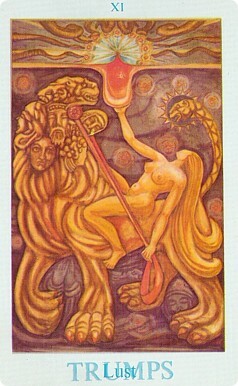 While similar to classic Tarot’s Strength card, Lust goes a step further by suggesting we should enjoy the pleasures of exercising our strengths, sating our passions, and embracing that which allows one to express the majesty of their unique self. 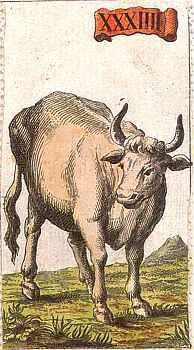 The lust this card indicates is not purely sexual, but at its most basic this lust is a primal desire to experience life to the fullest degree possible while taming our more beastly side. Lust implies that we not fight with our base instincts, but rather that we accept and manage and nourish them as an essential aspect of maintaining a balanced, complete self. 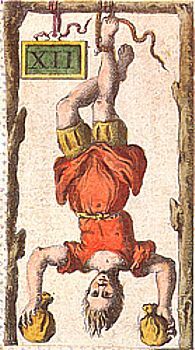 The reversed Hanged Man represents a preoccupation with the worldly and wasted energy. This is the card of false prophecy and time wasted. 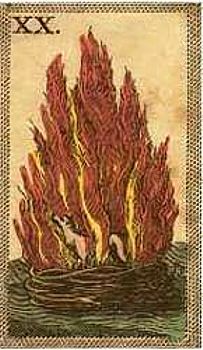 Fire reversed denotes calamity that may be on a catastrophic level. Prepare to deal with changes you do not want. Where the Green Man appears the mystery and untamed energy of nature abounds. The Green Man indicates the presence of choices and powers that have not been muted by civilization. The Green Man represents the antithesis of technology and industrialization. 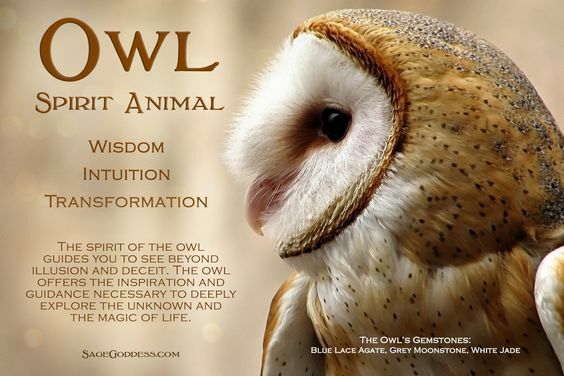 He offers primal energies veiled in mystery and derived from the spirit of nature in its purest form. 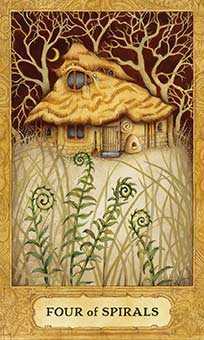 As a daily card, The Green Man indicates you are in a place where you will be well served by exploring your place in the natural world. At the moment the wisdom that will serve you best cannot be found in books or on talk shows or extracted from today’s headlines. What’s called for is an affirmation of your place in the natural world. You are confronted by a misunderstanding that you might have used to your advantage. Someone is not as forgiving this time. 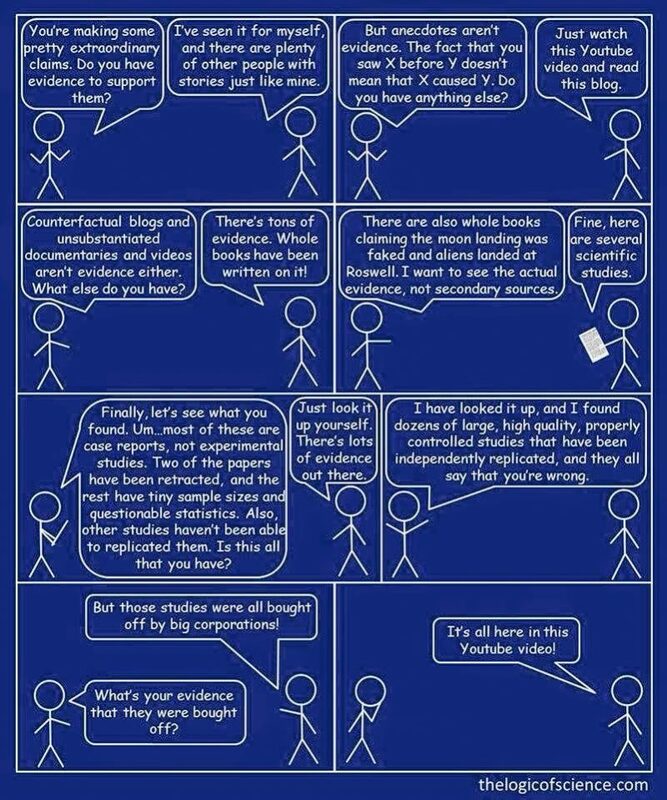 Are you discovering a new set of facts? 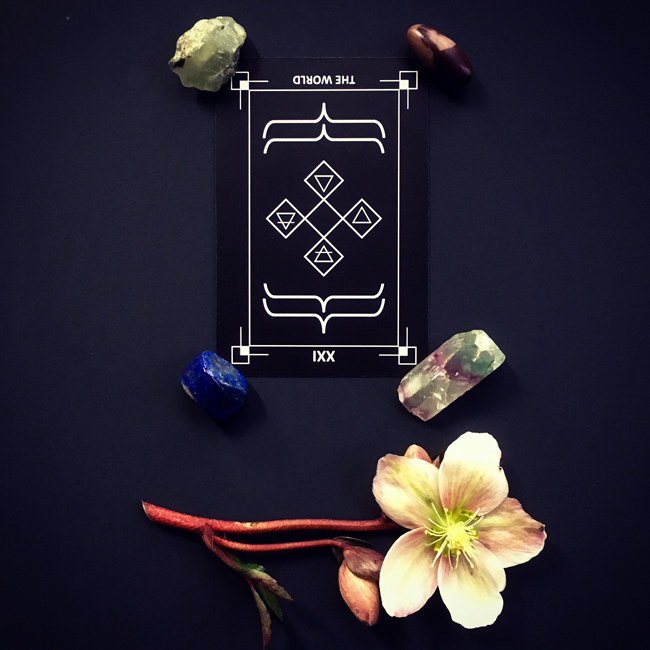 Meaning: This is a rune of difficulty and negative influences will rule your life for a time, but as all difficulties are a learning experience it will lead to improved personal perspective and progress on your life’s path. 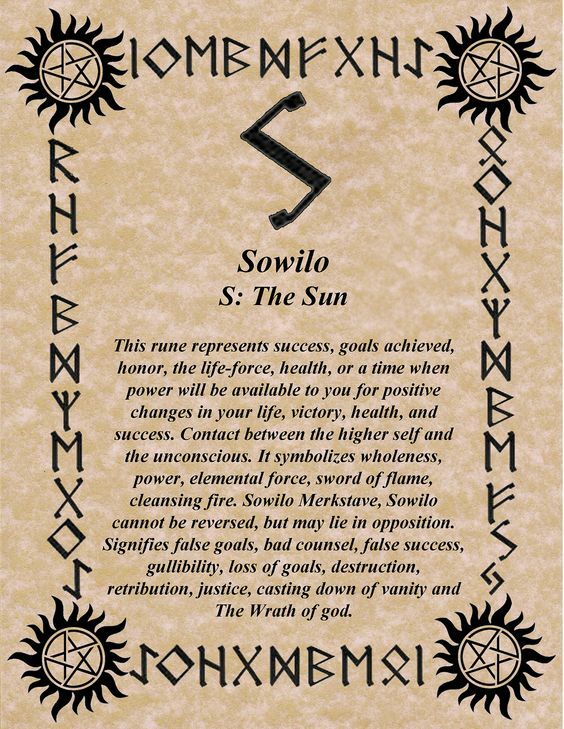 Always consult the surrounding runes with this stone. If it lies with a positive stone, it indicates that the pain of this experience will lead to a beneficial change in circumstances. When one has the feeling of dislike for evil, when one feels tranquil, one finds pleasure in listening to good teachings; when one has these feelings and appreciates them, one is free of fear. … interdisciplinary research to reduce the spread of fake news and to address the underlying pathologies it has revealed. Falsehood also diffused faster than the truth. The degree of novelty and the emotional reactions of recipients may be responsible for the differences observed. We investigated the differential diffusion of all of the verified true and false news stories distributed on Twitter from 2006 to 2017. The data comprise ~126,000 stories tweeted by ~3 million people more than 4.5 million times. We classified news as true or false using information from six independent fact-checking organizations that exhibited 95 to 98% agreement on the classifications. Falsehood diffused significantly farther, faster, deeper, and more broadly than the truth in all categories of information, and the effects were more pronounced for false political news than for false news about terrorism, natural disasters, science, urban legends, or financial information. We found that false news was more novel than true news, which suggests that people were more likely to share novel information. Whereas false stories inspired fear, disgust, and surprise in replies, true stories inspired anticipation, sadness, joy, and trust. 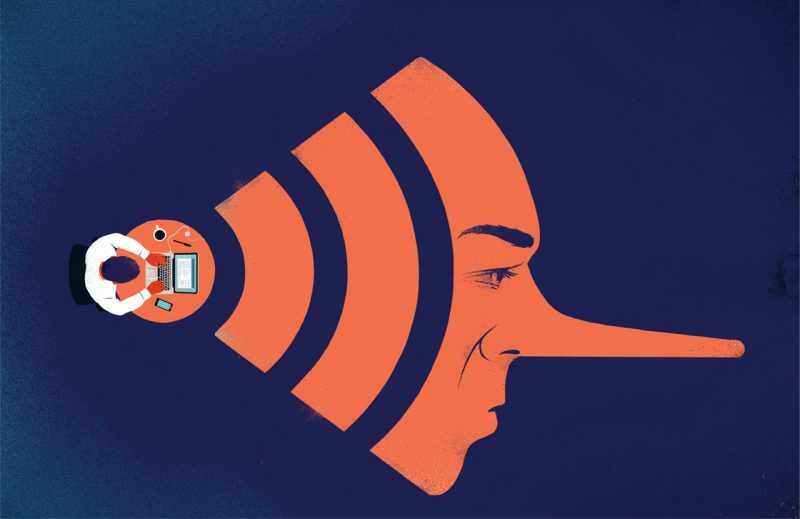 Contrary to conventional wisdom, robots accelerated the spread of true and false news at the same rate, implying that false news spreads more than the truth because humans, not robots, are more likely to spread it. Internet platforms have become the most important enablers and primary conduits of fake news. It is inexpensive to create a website that has the trappings of a professional news organization. It has also been easy to monetize content through online ads and social media dissemination. The internet not only provides a medium for publishing fake news but offers tools to actively promote dissemination. The group points out that, on the internet today, websites can operate relativity cheaply in contrast to in the past, where information had to be printed in monthly magazines or daily newspapers or, as in the particular case of EarthSky, for example, disseminated via radio. Some readers might not realize the extent to which small, privately owned websites like EarthSky can say … well … anything. If we at EarthSky wanted to say the moon is made of green cheese, we could. In the 20th century, that statement wouldn’t have flown. Saying it would have put us in the fringe group category. But in today’s anything-goes world of information overload, if we said it often enough, convincingly enough, with good charts and illustrations, with quotes from known historical figures saying it (taken out of context, naturally) – with glaring news headlines making outrageous claims that don’t really match reality (or even always match what’s being said in the article below the headline) – a portion of our audience might begin to believe it. Some portion of those believers might become devoted followers of our moon-as-green-cheese stories, in which case they’d spread our stories via their own social media outlets. We might become a moon-as-green-cheese community online, a place where, in our comments sections, people would suggest that non-believers should “wake up,” and see our (distorted) light. Research also further demonstrates that people prefer information that confirms their preexisting attitudes (selective exposure), view information consistent with their preexisting beliefs as more persuasive than dissonant information (confirmation bias), and are inclined to accept information that pleases them (desirability bias). Prior partisan and ideological beliefs might prevent acceptance of fact checking of a given fake news story. Search engines like Google helpfully promote people’s preferences. If you believed the moon was made of green cheese, say, and read articles on that subject, search engines like Google are programmed to show you more of the same, truth or falsehood notwithstanding. A first step in future academic studies of fake news will be to define key terms. Lazer and colleagues’ Science article was discussed in a March 9 article in The Atlantic, titled Why It’s Okay to Call It “Fake News”. The Atlantic article primarily discussed the question of whether fake news or false news is the preferred term. As academic studies proceed, those sorts of terms will come to be defined. We define “fake news” to be fabricated information that mimics news media content in form but not in organizational process or intent. Fake-news outlets, in turn, lack the news media’s editorial norms and processes for ensuring the accuracy and credibility of information. Fake news overlaps with other information disorders, such as misinformation (false or misleading information) and disinformation (false information that is purposely spread to deceive people). Journalistic norms of objectivity and balance arose as a backlash among journalists against the widespread use of propaganda in World War I (particularly their own role in propagating it) and the rise of corporate public relations in the 1920s. … Failures of the U.S. news media in the early 20th century led to the rise of journalistic norms and practices that, although imperfect, generally served us well by striving to provide objective, credible information. We must redesign our information ecosystem in the 21st century. This effort must be global in scope, as many countries, some of which have never developed a robust news ecosystem, face challenges around fake and real news that are more acute than in the United States. More broadly, we must answer a fundamental question: How can we create a news ecosystem and culture that values and promotes truth? Most fake news stories center on politics, by the way, but science news has its fake stories, too, with the best-known one, probably, being the nefarious so-called “chemtrails.” You might know of people who believe that the ordinary contrails left by jet aircraft are these “chemtrails,” part of a vast, secret, global conspiracy to … what? The described purpose has morphed and changed over the years, but currently most “chemtrails” believers will tell you that Earth’s climate is being secretly and deliberately engineered (to make it hotter? colder? I’ve never been clear on why, and I’m not sure if all chemtrail-believers agree). As with all good lies, the chemtrails conspiracy theory contains its grain of truth. There are indeed historical references to geoengineering and weather modification among scientists. Modern scientists continue to use the term geoengineering to describe the idea of deliberately altering Earth’s climate, in case global warming becomes so severe that nations agree on a need to implement drastic action. Nothing has happened yet. I think there’s about a 50/50 chance we end up flying this year. Meanwhile, a 2016 survey of 78 atmospheric scientists overwhelmingly showed that the so-called “proof” for “chemtrails” is not proof at all. I’m beginning to think that people who believe in things like “chemtrails” (and also “the moon landings were a hoax,” for example) are truly brainwashed, not in the sense of being forced to believe, but in the sense of having absorbed an overflow of false information. There’s an interesting film about this sort of brainwashing called The Brainwashing of My Dadby Jen Senko. I highly recommend it, if you’re interested in this phenomenon. And the Goddess created a new animal to be a companion for Man. And it was a good animal. And the Goddess was pleased. And the new animal was pleased to be with Man, and he wagged his tail a lot. Don’t forget for all your magickal needs in 2018, Shop Magickal Necessities! 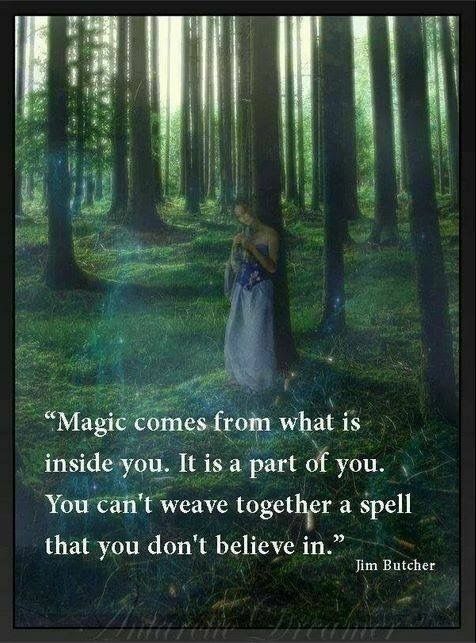 We Do Not Inherit The Earth…..
Wishing All Our Dear Brothers & Sisters of The Craft A Very Beautiful & Blessed Day!